Twelve South has been known for their gorgeous product designs that matches those of Apple, and their latest addition is no exception. The HiRise is an adjustable stand for your iMac or Thunderbolt display as well as a built-in storage area for your external hard drives and other gadgets. 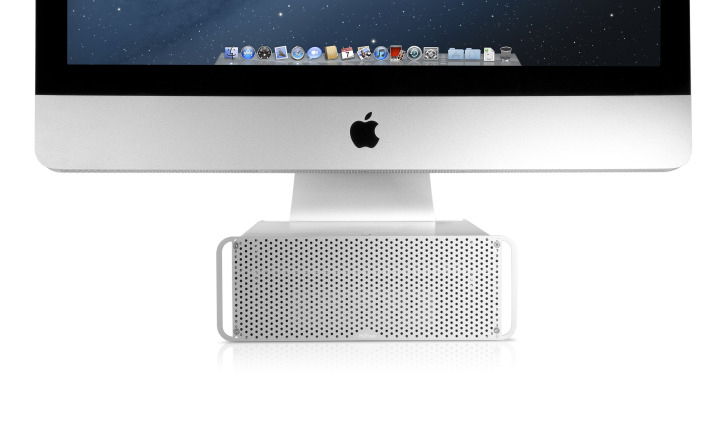 The product looks similar to the Mac Pro's design and would fit right in with your Apple set up. It has been a common problem for a lot of iMac users who are looking for just a little bit of a lift on their huge screen estate for a more comfortable experience but just can't find the right height or accessory. This is where the HiRise shines; it is adjustable to a number of heights to fit just about everyone's needs and it looks amazing. The front face plate features a magnetic seal so just simply pull down to access whatever you chose to put inside the HiRise. The simplicity and functionality is great for anybody looking to prop their iMacs or Thunderbolt displays up a little higher and to gain much more storage space for their gadgets. The HiRise comes in at $79.99 and is available now on Amazon. Catch the video after the jump to see the HiRise in action.